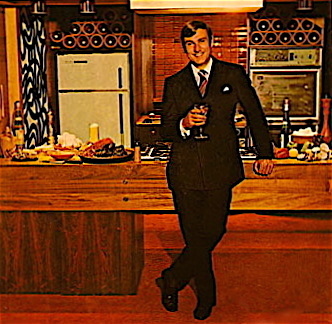 A pioneer in food television and celebrity cooking is unquestionably Graham Kerr. The debonair, self-deprecating charmer of the 1960s and early 70s changed the face of TV cooking permanently. He is also a prolific author on cooking and food, with some 30 books to his credit. Always dressed well whether casually or formally, his ever-present smile and non-stop quips kept the crowd rapt. It is a sign of his talent and appeal that a Briton who started his broadcasting career in remote New Zealand – at the edge of the developed world 60 years ago – became an international food celebrity. His award-winning Galloping Gourmet series was produced in Ottawa, Ontario from 1969-1971 after he came to notice as a pitchman on Australian TV. The shows launched Kerr’s enduring culinary fame. His late wife Trina, a former actress, was producer and this was a key part of his success. When the series ended they moved to California and Kerr was poised for a Julia Child-like ascendancy. Unfortunately, a bad car accident, and health issues for his wife set the family back for a while. Ultimately they took a new direction and became born-again Christian. Kerr continued in the food and nutrition field but focusing on healthy eating and abjuring the wine glass and racy jokes of old. His later work including on the PBS network did well enough, and even today, semi-retired at 82 and living near Seattle, Kerr keeps his hand in various food activities. But it is the old Graham Kerr whom most will recall fondly. The Galloping Gourmet shows are so well-remembered that the Cooking Channel re-broadcast the series, as explained in this informative blogpost by Sarah Levine. In this Galloping Gourmet clip from c.1970 you see him at the apogee of success. He bounds into the kitchen holding a glass of wine, a fixture of the shows although he drank little or nothing on air despite impressions given. In this performance he does a stand-up routine to rival that of a professional comedian. The show’s topic was recreating a beef and beer dish he encountered at a hotel in Clifton, England. Sample quip on the commemorative “Investiture Ale” used in the dish: “They can’t sell it so they use it for cooking”. His U.K. accent emulations were dead-on, a recondite talent from a North American standpoint that did nothing to slow his success. As far as I know one can’t view online, if any episodes survive, his original New Zealand TV show. It debuted in 1959 in black and white, called “Entertaining With Kerr”. But a dozen at least colour episodes of the Galloping Gourmet can be seen on youtube. They illustrate well a corner of Anglo-American culinary history. Kerr wasn’t the first chef to appear on television. James Beard may have been the first, at least in North America, in 1946. I believe BBC television, around 1938, featured the very first televised cookery demonstration. And the Canadian chef and food writer Jehane Benoit, of whom I’ve written earlier, had appeared on CBC television by 1960. But Kerr was the best of all of them, in the estimation of many. As for Julia Child, he had experience in the culinary arts for years before becoming a household name, starting in a Sussex hotel owned by his family. He grew up in the business and his deft way with people must have come from the early years of always being “on”. He also served in a British Army catering unit (1950s), and after leaving hotel work performed catering duties in the Royal New Zealand Air Force. After fame arrived he would poke fun at himself for the military catering. Yet, the field is an interesting one that deserves greater attention from the culinary world and food scholars, while to be sure few would consider it the apotheosis of a military career! Decades before Anthony Bourdain’s acclaimed food and travel series “Parts Unknown”, Graham Kerr was doing something similar. Indeed he devised the template since a number of Galloping Gourmet episodes were based on visits to foreign locales and reputed dining spots, with camera crew in tow. Kerr recreated some of the dishes in an Ottawa studio and regaled the audience with anecdotes. The Cooking Channel posted online the recipe featured in the Clifton episode, you can read it here. It is rump of beef cooked in beer. To my mind it is mostly English in character with some Continental influences. The barding of meat is a French standby, not an English one or at least a modern English one. The sugar, vinegar, and herbs have a Belgian ring, while the mushrooms and oysters sound more English. Overall there is the impression of an old English country dish. You can find beef recipes not all that far apart in Dorothy Hartley’s Food in England, say, or in Elizabeth David’s writing. In Kerr’s day dining and cookery were much influenced by the Continental style, a post-WW II meme of international hospitality. The cooking blended different European traditions and was served with a particular style of service and decor, often associated in fact with international hotels. The term sounds old-fashioned today but we believe the Continetal style will come back. Sole amandine, say – it’s as good now as it ever was. Green peppercorns, garlic presses, fondues, crêpes Suzette, duck with orange sauce, and so on. Toronto readers who remember the Prince hotel in the 1980s will recall its Continental-style cuisine, that was a good example. Note re image: image above was sourced from the article of Ms. Sarah Levine linked in the text. All intellectual property therein is owned solely by its lawful owner, as applicable. Used here for educational and historical purposes. All feedback welcomed. *Note added March 22, 2018: this NYT story on Kerr, from only last year, brings his career up to date. Thanks for this piece, Gary. I remember watching him as a young boy with my parents. They loved the show, and I enjoyed watching it with them. Mom thought he was rather dashing, and would giggle a lot while trying to keep up with frenetic note taking. Dad loved the fact that he was always drinking (your revealing his not finishing his wine would not please him…though I’m sure he would insist he was drinking it down on breaks and refilling…LOL), and I just thought he was…peculiar. As a youngster, it was fun to watch such antics on the few staid television stations available at the time. You should check out his website, http://www.grahamkerr.com, he’s 82 now and lot’s changed, still interesting though. If I could sit down with him, I’d have lots of questions, e.g. what was it like during the war in England, and his years of military service. What did he think he Canada, what does he think of the current food scene, etc. I just watched the episode mentioned. He’s extremely charming and funny, very “old school” (in the best way), but smart too and obviously (humour aside) passionate about food. Dishes like these must have seemed, as you suggest, fairly exotic back then. “International”, when most wouldn’t have dreamed of traveling to Europe. All the parts are well-worth watching, and Kerr’s pre-Ottawa days are reviewed, from his army service in catering in England through to the NZ and Australian tv career. There are black and white clips of him in the Australian mid-60s period. As you say, he was (is) smart obviously, and his wife Trina (now deceased) clearly had a big part in his career as well. No question he knew food very well, you can’t pretend about this kind of thing and get to the level he did. He had other quirks and features, as did Julia Child, which helped them on their way, but the deep knowledge they had of cooking is evident in all their work. I could tell just from how he did that beef and beer dish.